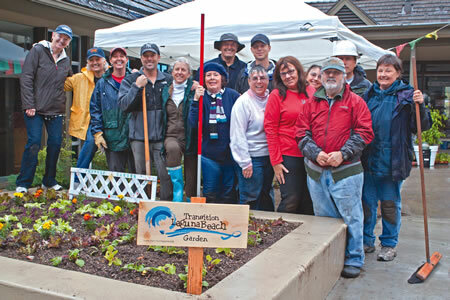 Thanks to Transition Laguna volunteers, the Neighborhood Congregational Church will soon be able to grow the organic vegetables they cook up in soup for those in the homeless shelter during winter. A first step towards a larger overhaul of the church’s landscaping into edible agricultural and water-sipping plants was accomplished last Saturday. Despite drenching rain, almost 20 volunteers helped plant orange trees and drought tolerant plants as well as building some vegetables beds. Next month, volunteers return to plant more. Rev. BJ Beau is proud to serve as a community model. “I am honored that almost 20 people came to help our church reducing its ecological footprints. This partnership with Transition Laguna is a reminder to let the people see how much we can still do when we work together,” he said. Though the Neighborhood Congregational Church serves as the first church property to embrace the philosophy of edible landscaping, the group’s manpower in recent years has accomplished similar yard transformations, mostly at private homes but also at the Boys and Girls Club or the El Morro School, supplanting decorative plantings with crop-yielding garden plots in one-day installations. It’s another example of a community becoming more involved and engaged in what they eat. Gloria Broming, an active Laguna Transition member, first proposed teaming up with the Congregational Church. “We do not just install gardens; it is a continuing education,” said Broming, of the group’s monthly meetings, which also occur at the church on the first Tuesday of each month. The third Saturday of each month is devoted to a garden installation. A potential recipient of an installation must not only decide on the sort of crops they want to grow, but get their hands dirty by volunteering with at least three other garden installations, said Broming. “At the end, we always celebrate by having food all together,” she said. Transition Laguna’s goal goes beyond encouraging cultivation of organic vegetables, but growing a community more attuned with their own nutrition and nature’s growth cycles, said board member Cody Oakland. “As responsible adults, we have the opportunity to grow our own products, thanks to the southern Californian climate that we have here. So we have to take advantage of it. And you do not need to be a Ph.D. to learn how to grow your own products. You just have to learn a few simple things and that is what we are trying to do with Transition Laguna,” he said. While many in Laguna seem attuned to green issues, some organizations still struggle to find an audience. Last month, World Wide Opportunities on Organic Farms, based in Laguna Beach, announced itself as a part of a world-wide effort to link volunteers with organic farmers, promote an educational exchange, and build a global community conscious of ecological farming practices. Local resident and WOOF program manager Tori Degen said: “What we do is find organic farms ready to offer free meals to the volunteers ready to help with the harvest and the work in the farm. People in Laguna are really healthy people and I think they could be interested in our program. This is an easy way to travel the world at a minimum cost because the farmers take care of everything,” she said. According to the WWOOF website, there are 252 hosting farms in California. Degen said that the closest ones are in San Diego County, but the website lists some farms ready to host within the county. Nevertheless, despite the Indy’s efforts to go to local fields to see what volunteers learn about organic methods, Degen apparently had no takers. She said people in Laguna are unfamiliar with WWOOF. Apparently, neither do growers or perhaps they don’t need the services provided by this non-profit. “Maybe because it takes some time to grow and people in Laguna do not have lots of time. It also takes almost five years for the farmers to receive the organic label. And personally, I had never heard about them. 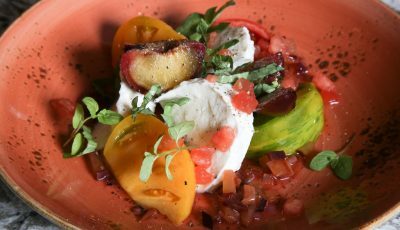 So maybe we should just spread the word about WWOOF because what they propose is quiet fabulous,” said Nic Romano, of San Clemente’s VR Farms, who taps a Riverside grower to supply organic produce to restaurants such as those at the Montage resort, Soka University’s cafeteria and to consumers who commit to weekly purchases. Success seems to sprout in Romano, the modern day version of Johnny Appleseed. “We teach people all the way from the seed to the farm table we have meals on. I just want to take them in the field and show them how things grow. We are teaching how the circle of food happens,” he said. What Romano is teaching is similar to Transition Laguna’s efforts. Everything started for Romano when he received permission to plant on two acres of a golf course. He rebuilt the soil in a demonstration garden, where he holds wine and food tastings and shares his infectious enthusiasm for locally grown food. “We encourage people to plant. They can plant anything as long as they plant. And they will discover that everything tastes different when it is fresh,” he said.